If you love beautiful accessories, cared in any smallest detail, this handbag having a glamorous and elegant cut must be part of your wardrobe. Trendy in style but classic and linear in its shape, the model we are showing you is extremely comfortable and functional in its inside, thanks to the double internal compartment, everyone closed by a twisted silver buckle and lined with high qualitative velvety black fabric. 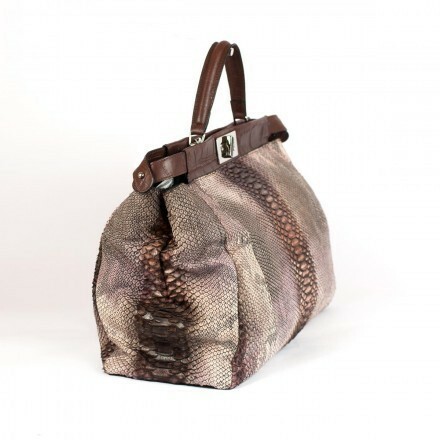 This division will allow you to preserve all your most intimate things in absolute order, but it will also give you another important advantage: the one to use this accessory as office bag, where inserting and preserving all your documents and business papers, in order to appear glamorous and cared also when you are at work. 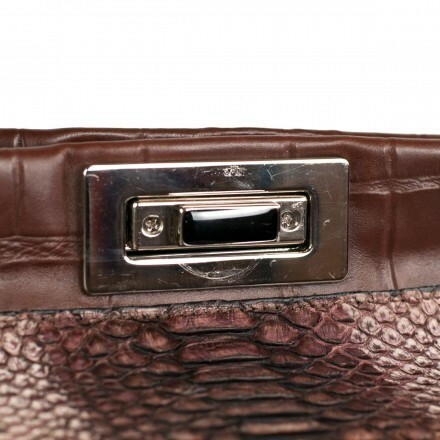 This item is discounted due to defects reported in the pictures - scratched lock. These defects result from the artisanal manufacturing and from the long-term exposure in the showroom. For more details, don't hesitate to contact us. 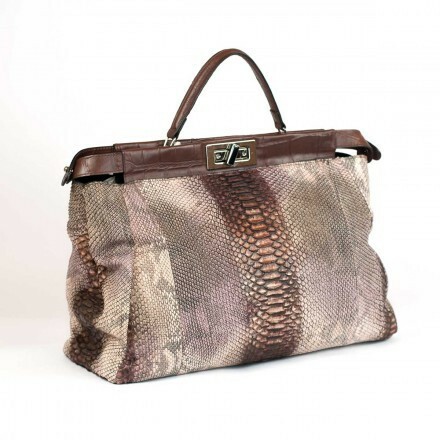 Model 5044 L is then provided with an internal lateral zippered document pocket and with a comfortable python detachable strap. The upper borders of the bag, so as the short handle, are realized with brown calf leather where the typical crocodile scales have been skillfully reproduced. 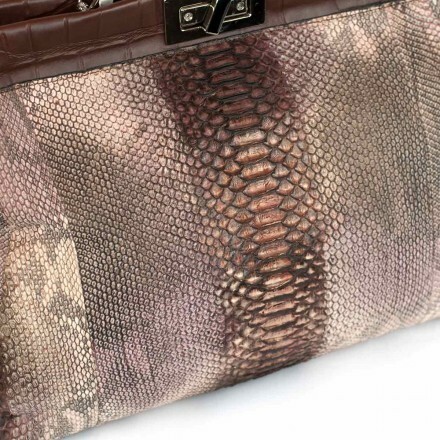 This leather obviously is put in contrast with the genuine python skin used to manufacture the remaining sections of the bag, extremely soft at the touch and having a velvety aspect, where the central sections, characterized by larger and more lengthened scales are opposed to the peripheral sections with smaller and rounded scales, also thanks to the contrast in tonalities; a dark violet tending to brown, used to enhance the larger scales is alternated to the shaded grey – lilac of the small peripheral scales. The same contrast of scales and colors is also proposed at the sides of the bag. What else can we say about this beautiful accessory? Well, we prefer not to say more and let you the pleasure to discover it in all its multiple qualities, once you receive it at home and have it in your hands! So, hurry up to buy it! OUTSIDE COMPOSITION: genuine python (the leather, carefully selected by our artisans, is soft at the touch and it shows a velvety aspect at the sight. 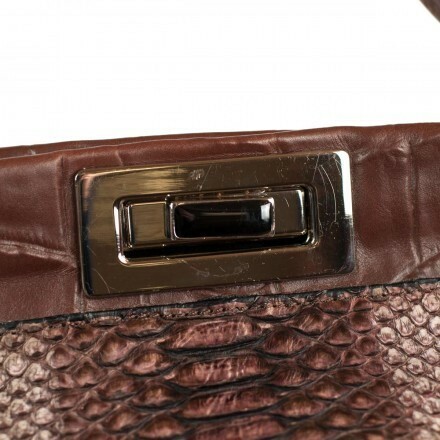 It is characterized by the alternation of big and lengthened scales, placed in the central sections, and of small and rounded scales, placed in the peripheral sections of the bag)+ embossed leather (on the calf leather, artisans have reproduced the typical crocodile scales) in the upper borders of the bag ( in proximity of the two twisted buckles) and on the short handle. LINING: the inside is lined with high qualitative velvety fabric in black tonality. 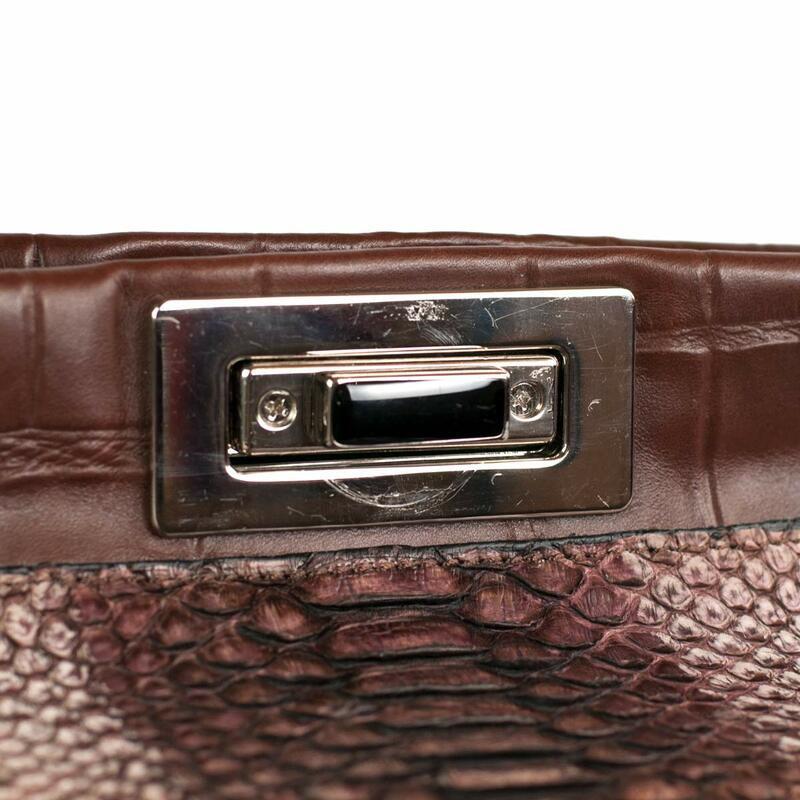 HANDLES: a short handle in calfskin + detachable shoulder belt in python leather. an internal lateral zippered document pocket. 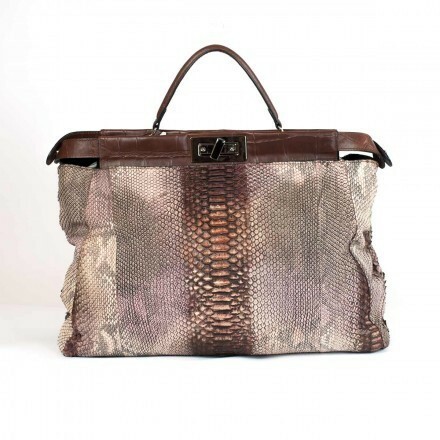 COLOR: dark violet python skin with lilac – grey streaks at the sides + brown embossed leather.